Everyone seemed to have a pretty good time with last week's headlight quiz, and many of you said you'd like to see more quizzes. How Good Is Your Car-Light ID Kung-Fu? Take The Quiz! Well, I'm all about making you readers as happy as you can stand before you burst into a disgusting puddle of rainbows and kittens, so here's another quiz. I tried to think: other than cars, what do car guys/girls like best? Poetry! Of course! 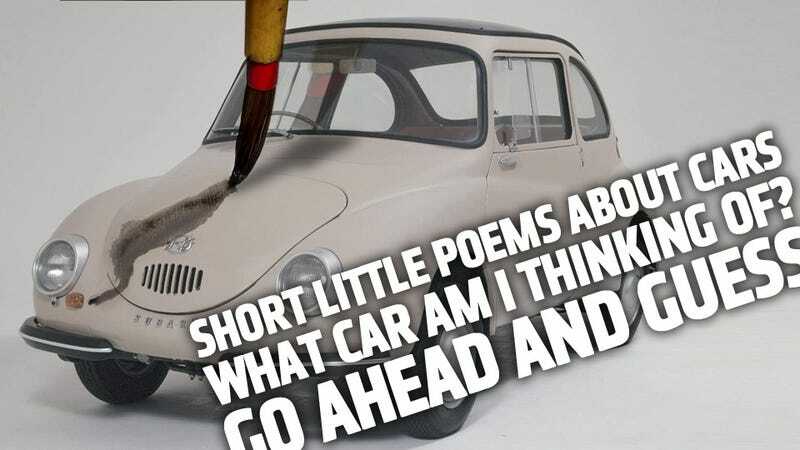 With that in mind, I came up with this week's quiz: guess the car that inspired the haiku. Haikus, of course, are based on the traditional Japanese poetic form, and I stuck to the '5 syllable/7 syllable/5 syllable' rule for making these. I didn't make them all— fellow Jalops Raph, Ben, and Travis all got in on the act and contributed some of the ones you see here. So, 12 haikus, for 12 cars. I'll post the answers at 9 PM EST so you can see how you did. Have at it! Joe told us some lies. This is kind of soothing, isn't it?